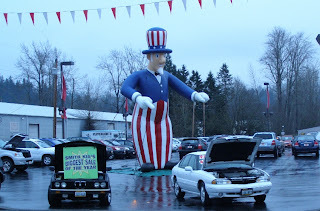 Editorials from Theslowlane: Picture of balloon doll of Uncle Sam? Picture of balloon doll of Uncle Sam? Uncle Sam strives to keep economy standing. House prices have been inflated well past much of the rest of the economy. This year, they are starting to deflate. It's kind of like huffing and puffing into a big balloon. Cars and other products have to sell so people can afford the mortgage, or if they are renters, so people can afford the rent.